In mid-size cities, total traffic decreases with higher density. In the biggest cities, however, the correlation breaks down and it’s hard to say what happens. 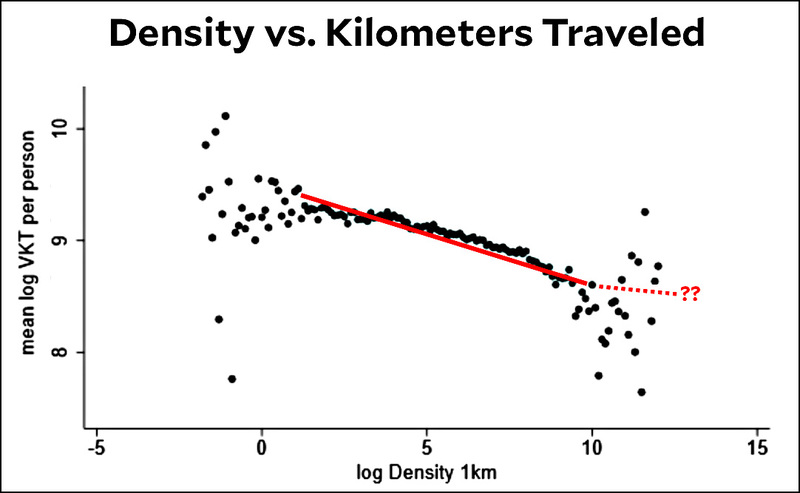 Higher density probably still reduces traffic, but the size of the effect is smaller and seemingly random. Urban density appears to have a small causal effect on driving….Our estimates of the relationship of driving to urban form allow us to assess the cost effectiveness of densification as a policy response to excessive driving. These estimates suggest that urban form is not cost effective compared to explicit pricing programs. In particular, even concentrating the population residing in 83% of the area the continental US into an area of about 1500 square kilometers would result in only about a 5% decrease in aggregate driving, and this policy appears to describe the upper envelope of what densification policies can accomplish. On the other hand, existing estimates of the gasoline price elasticity of driving suggest that a similar decrease in driving would be accomplished with a gas tax that is no larger than gasoline price fluctuations observed over the past five to ten years. Congestion pricing programs appear to have even larger effects. As it turns out, traffic in London is about as pokey today as it was in 1996. However, the congestion charge has still been a success: although taxi and delivery trips have increased, the number of car trips into London from the suburbs has fallen by about a quarter. If that hadn’t happened, congestion would be far worse than it was in 1996. One of the most persistent objections to denser urban development comes from residents who object to making congested streets even more congested. The evidence suggests that this is a legitimate concern, and to overcome it urban planners need to offer concrete solutions. Better mass transit is obviously one possibility, but it doesn’t necessarily reduce traffic at the location where someone is proposing to build a new apartment block. However, a congestion charge would reduce traffic everywhere, and at least stands a chance of mollifying residents who are tired of too many cars (and probably hate all the out-of-town commuters tying up their streets anyway). So far the idea of a congestion charge hasn’t caught on in America. New York almost got one recently, but the legislature killed it a few weeks ago. But if it ever does catch on, there’s likely a bargain to be made: a congestion charge—with proceeds earmarked for mass transit—paired with statutory and zoning changes that make it easier to get approval for dense residential blocks. Why not do both?